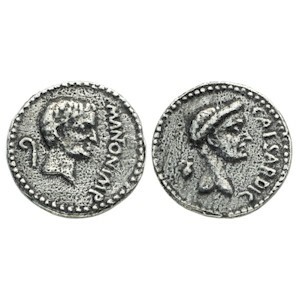 Obverse: Bare head of Marc Antony (Marcus Antonius) right, bearded, with lituus behind. Text before M ANTON IMP (NT in monogram). Reverse: Laureate head of Julius Caesar right, capis (jug) behind. Text before CAESAR DIC. History: Issued shortly after Caesar's death, the first issue of Antony under the security of his military camp combines his own portrait with that of Caesar, thereby asserting his leadership of the Caesarian party at a time when he was beginning to feel threatened by Octavian. Doubtless the propaganda was aimed at his soldiers, the loyalty of whom might be suspect now that Caesar's adopted son had become a factor in the political power game. The symbols of the augurate (lituus and capis) appearing behind the heads serve to emphasize the links between Antony and the slain dictator and thus to strengthen his claim to be Caesar's true successor. This is the first occurrence of Antony's name on a coin.